Further adventures of the temporarily disabled: Donna found out that you can borrow a beach wheelchair at Crab Cove in Alameda & also at Crissy Field in San Francisco. 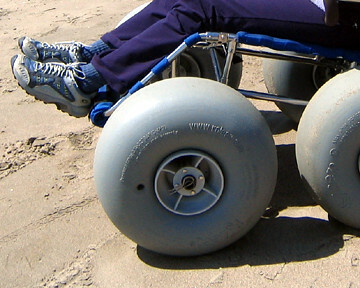 These are wacky-looking, dune-buggy-evoking contraptions & they definitely grab a lot of attention from everyone on the beach, so if you’re feeling shy it might not be the best thing. Anyway, we have now tried both. I’m pretty sure the one at Crissy Field is meant for a child; it’s really narrow & if we hadn’t brought our own cushion it wouldn’t have worked for me at all. It was also much harder for Donna to push than the one at Crab Cove. I think I was just too big & heavy for it. Fortunately, Crissy Field is liberally sprinkled with benches, so I ended up walking quite a lot (that’s a relative term), with frequent sitting breaks.